Since we had just a 12mi/20km road walk to do for today, we got to lounge at the Holiday Park till 12:30pm. 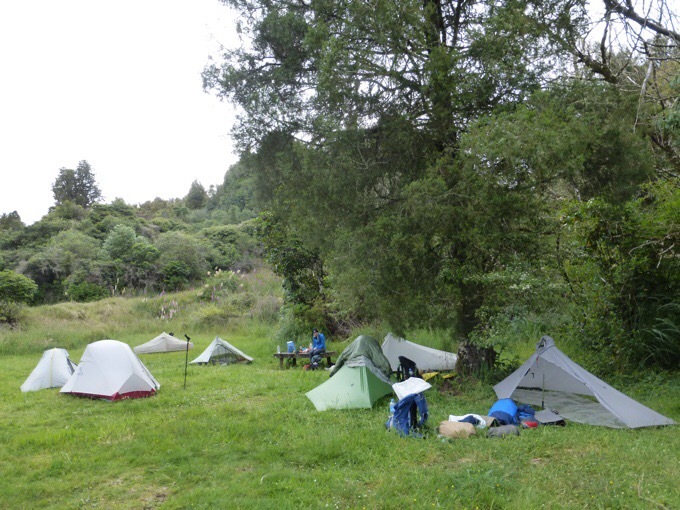 In order to be lined up to do the Tongariro Crossing on a possibly good weather day, we need to do it in four days (normally it would be our third day out). Since it isn’t that far, we could have taken a zero today and done two longish days to set it up or three relaxed days from town. Almost everyone doing the canoe the same day as us chose three relaxed days. Many of the group did their resupplies for the canoe leg this morning (we did ours yesterday). The canoe company conveniently picks it up from the Holiday Park and will bring it to us in a week when we set off on the river. I kicked myself for not documenting everyone’s food with more photos, dang! 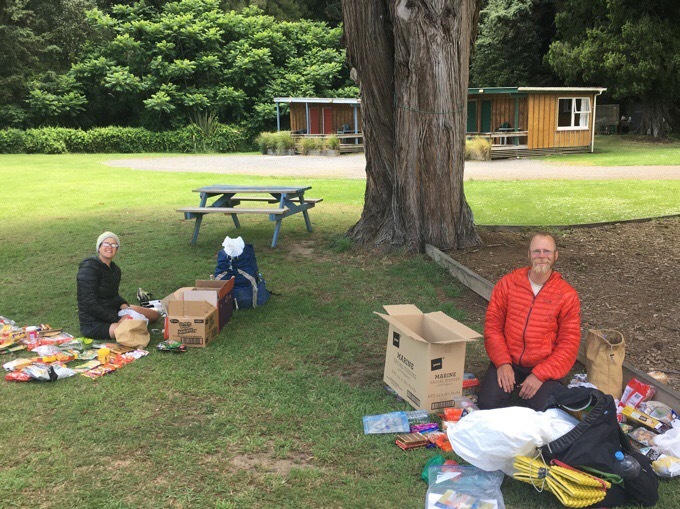 Matt and Laurel organizing resupplies. I had my second pair of shoes sent to town and think it was timed pretty well. The forests out here tear up shoes. Most replaced theirs in Hamilton around the 500mi/800km mark, but I wanted to stretch mine a bit further to the 650mi/1050km mark. I’m glad I did that. They had some good holes in them I was too lazy to stitch (forgot to take a photo), but the tread was fine. I’ve never seen more stitched up shoes than on this trail. I use La Sportiva Bushidos. Not as cushiony as I would like, but they fit better for my foot than other options. Most people out here wear trail runners with how wet and muddy it is with road walking thrown in. In the first two weeks, those with boots were suffering on the 90 Mile Beach and road walks. It was a gamble and a stretch, but I’m glad I waited till now. We’ve gone through two pretty brushy muddy forests in the last couple legs and they tore up shoes already that were new in Hamilton. I got to break in the new shoes on a highway walk today. 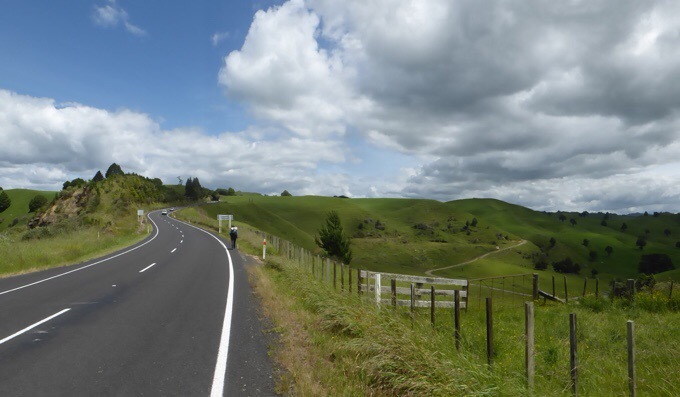 Thankfully, it wasn’t a super busy road on a Monday, and the scenery was nice. 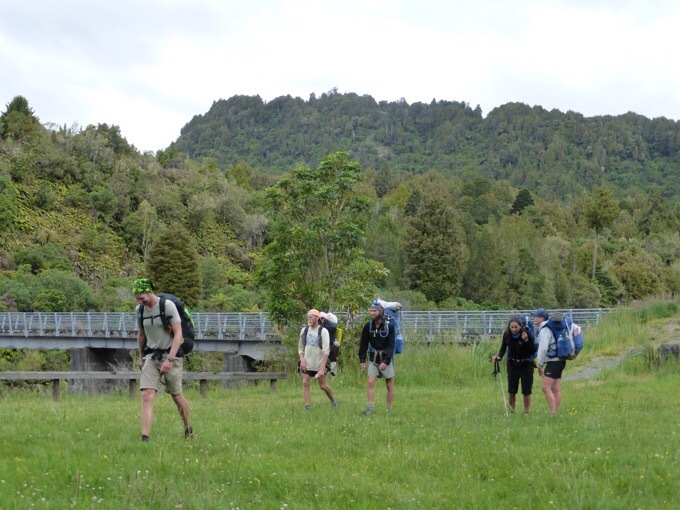 We even walked next to the Whanganui, which we will be paddling further downstream in about a week. 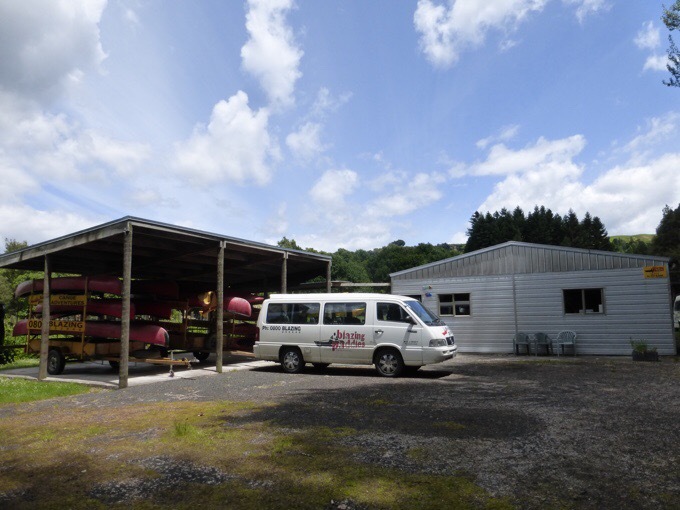 Just about 5km out of town was the Blazing Paddles place where we needed to check in with the company to pay and get sized for life jackets. 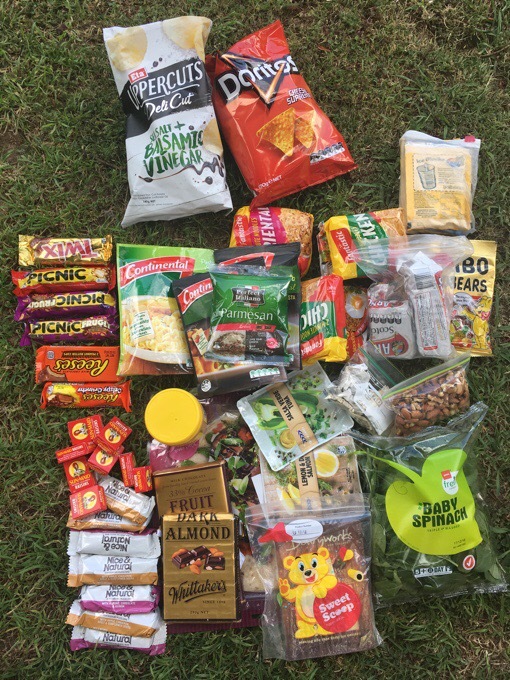 It’s convenient that it’s in town and that they pick up our resupplies from the Holiday Park, so we don’t have to go out of our way at all to get all this organized. Another tour company warned us that it may be the cheaper option, but that we won’t get the customer service and that it locally doesn’t have the best rapport with the other canoe companies. Our personal experience has been very nice so far. It really made me appreciate it so much more than when we drove it in the blink of an eye. Yesterday, in the car, I had felt no connection to it, but having now walked it, I can really remember it and soak it in. It was a good reminder of why it’s worth it to walk the roads. 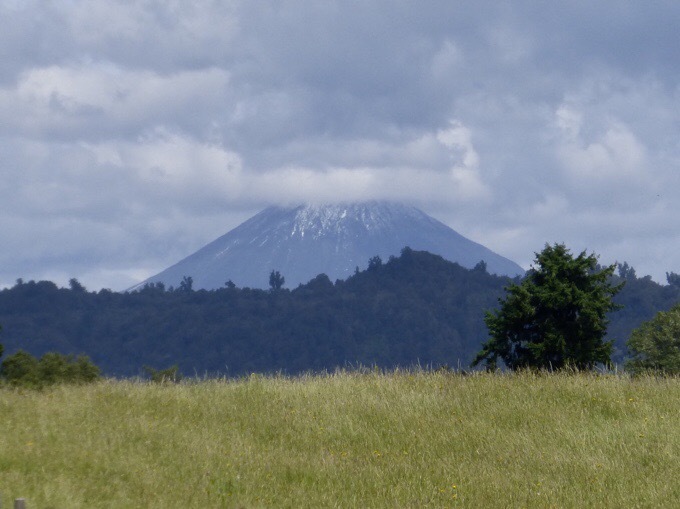 We also got the excitement and anticipation of our first view of Mt Ngauruhoe (Mt Doom in Lord of the Rings). 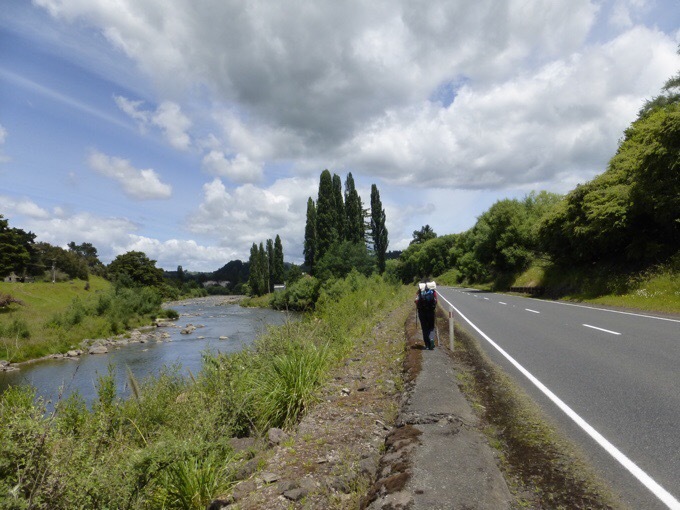 We hope to summit it when we do the Tongariro Crossing. We saw some photos of some hikers that went up there and did the Crossing in clear weather this morning. It’s such a crap shoot. We hope the same works out for us in a few days. 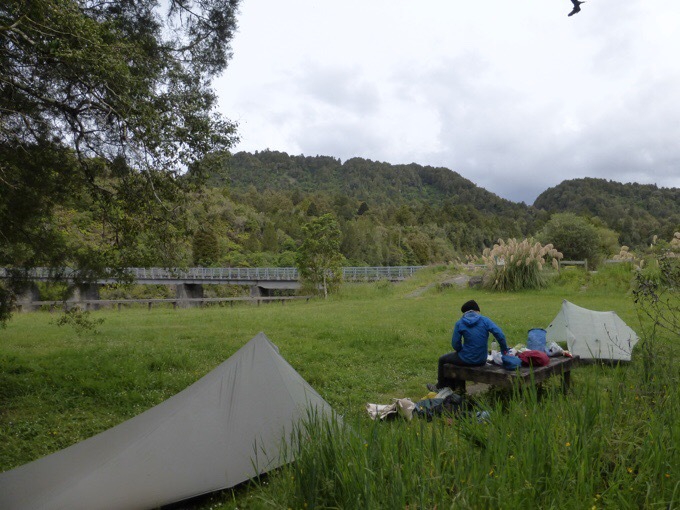 Becky and I got to camp next to the Whakapapa River at 5pm. 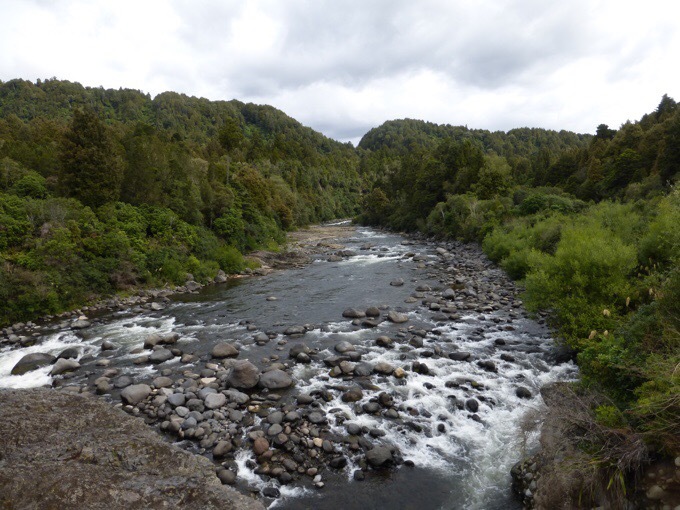 It’s a great spot with a bathroom, plenty of space, and a cool bridge over the impressive river. An hour or so later, most of the crew we will be paddling with arrived; Heartbreaker, Vittoria, Matt, Laurel, and Tom. Angelynn needs to meet someone in Wellington and had to push on a bit faster, so she won’t be doing the canoe with us. There are at least two others that will also meet up with us the day we launch. Tom, Heartbreaker, Matt, Vittoria, and Laurel. It was a relaxed and enjoyable night. I could get used to this relaxed schedule we are on for the next two legs! 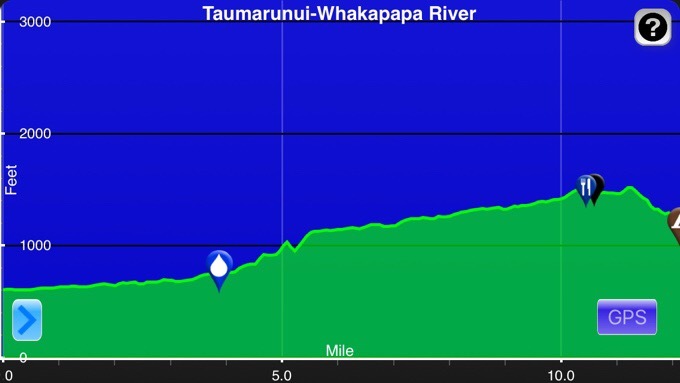 We intentionally didn’t want to push through this section and the river section, so it will be shorter mileages, sleeping in, and going to bed early. I’m all up for that! I don’t know if it’s the insane amount of pollen in the air affecting many out here or what, but I’m enjoying the shorter days and sleeping more. Maybe I’m getting old, gasp! I like that there isn’t impending doom of snow at the end of this hike that would force a more grueling itinerary. It’s a new way of more relaxed hiking for me, and I’m not getting antsy to push forward like I usually do. 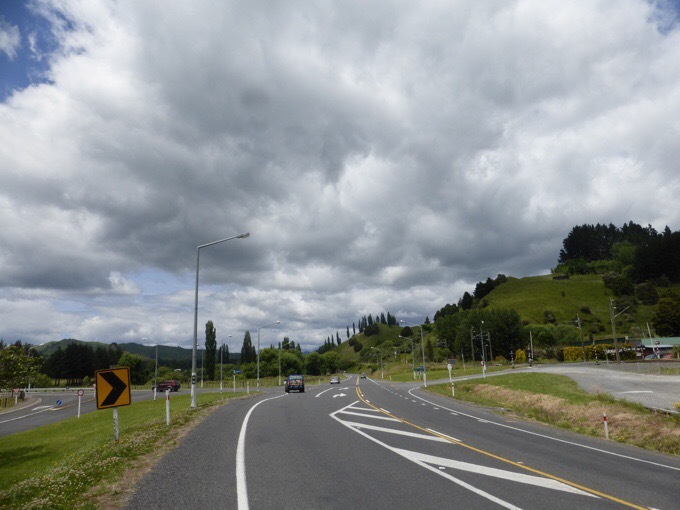 We want a shot at actually seeing the Crossing and doing Mt Doom, so it’s worth the wait for the clearer weather day. Plus, knowing our canoe date is set, there really is no reason to push any faster to get anywhere. The next two days will be more taxing, with mud and lots of elevation change, so I’m sure I’ll be plenty tired at the end of the day. 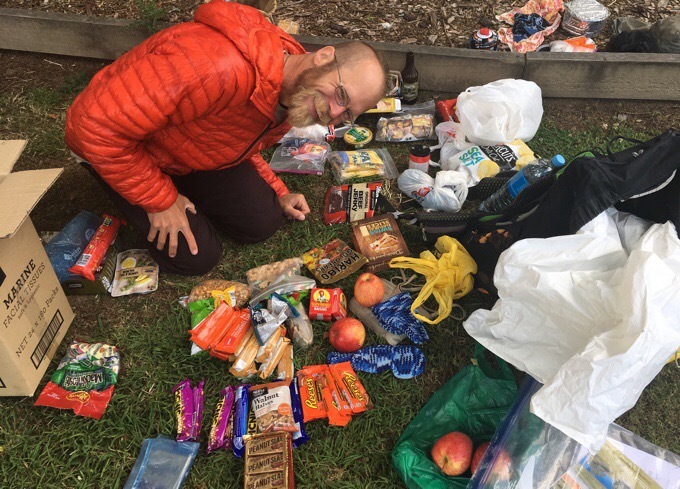 We will probably hike 2-3hrs less each day, but if we did more, it would land us in the middle of the Crossing where we can’t camp and where the huts are booked solid because this is the heart of the tourist season. Not how I’d instinctually hike, but it is growing on me…it feels like a vacation! It’s all coming together and you are wearing new shoes! Good for you. And hope the weather cooperates for all of you. Good luck for the Crossing, Erin! Yes, it’s unseasonably cold and unsettled. Super windy in Auckland today. I’ll have a quick chat to the weather gods for you. Looks like the chat worked. Going to be spectacular for us tomorrow! Australian Survivor went 55 days this year so you can have another shot at it 🙂 I’m looking forward to the finale this week – it’s been a good season. My daughter will be studying abroad in Hamilton in Feb so it’s fun to follow along while you are in the area. Looks “perfect”! I’ve driven my 14-mile commute thousands of times over 20 years. I ran it one day and it blew me away the details and things I noticed that I had never picked up on in the past. I agree with your thoughts on that today. Good for you holding out for decent weather- the Crossing is truly unique- nothing like anything you have done so far or will do in the South Island. It would be a shame not to see it in good weather. It truly is spectacular. AHHH that picture of Mt. Doom is so exciting!!! I can’t wait to read all about your summit 😀 fingers crossed everything works out! That picture gave me the first big set of chills from the blog this hike! Just keep a good lookout for Shelob on your way to Mt Doom. It’s a Six Moons poncho tent and they said they just get bundled in their sleeping bags and it’s only a bother when it’s a hot night. I’d be worried too.